A wealth of cultural events are organized every year. If you wish to listen to the municipal symphonic orchestra or to dance pentozali, you can always find a place to go. The Municipality of Heraklion is also a supporter of many exhibitions, seminars and other cultural events throughout the year. The annual Summer Festival lasts from July 1 until the mid of September. It presents significant artists in a festivity of music, dance and colors. Crete has one of the oldest and most tasty gastronomic traditions in the world, a tradition of tastes, aromas, ingredients and skills which begin from the prehistoric years and continue until today. The Cretan diet constitutes the subject of study, since the majority of studies demonstrates that the Cretan cuisine is the most characteristic example of the Mediterranean diet. Visit traditional tavernas or modern restaurants, spread all over the city, and taste their Cretan cuisine. Heraklion today is living between the fast moving currents of regeneration and a deep desire to maintain links with a past. Both these strands define its character. The ‘old town'' areas of the city, established from mediaeval times, now offer visitors some fantastic walks in the heart of the city. The fortified enclosure of the Venetian Chandakas of the 15th century is one of the most significant monuments of its kind in the whole mediterranean basin. The Museum of Natural History where representative samples of the flora and fauna of Crete are exhibited. Cretaquarium is part of the Thalassocosmos complex, the largest research, technology and entertainment centre in the Mediterranean. The fact that Heraklion was an Olympic City of the Athens 2004 Olympic Games, gave a boost to the city''s sporting infrastructure. The new Pancretan Stadium and the new Indoor Sports Center complement the existing infrastructure of the city, and gave citizens more places to exercise and the opportunity to organise a lot of sporting events. Recently, Municipality of Heraklion offers free bicycle rental service to citizens and visitors. Heraklion is a lively shopping city with a lot of shops within walking distance. It offers an exciting mixture of modern shops, stock houses, pedestrian areas and galleries. Daidalou, Dikaiosinis, Kalokairinou and their surrounded streets are full of exclusive fashion and big chains'' shops. Talos Plaza, a shopping center in the costal area of the city, offers convenient shopping in one place. Open markets are organised every weekday in several areas offering fresh fruits, vegetables and cheap clothing. Heraklion is on of the most lively cities of Greece. You can find something for everyone. Nightclubs, bars, traditional coffee shops and modern cafeterias are located all over the center of the city. Lions Square, Freedom Square (Plateia Eleftherias) and the streets around them are full of bars, cafeterias, tavernas and restaurants. 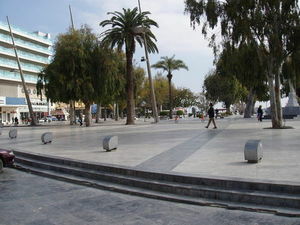 The costal area of the city is also a place to visit with nightclubs and tavernas beside the sea. During the summer, numerous art festivals and cultural events are organised, with tradional cretan music and modern music, dance and theatre performances. Close to the centre of the city, one in the east and the other in the west, two well organised clean long beaches offer a great experience under the Cretan sun. Amnisos Beach,in the east, and Ammoudara Beach, in the west, with modern infrastructures for bathing, lifeguard, sea sports and other sea pleasures Both beaches can be reached easily by local bus. The visitors of the city can also enjoy the water parks which are available very close to Heraklion.